“Man tracht un Got lacht”. Man plans and G-d laughs. Sometimes stuff just happens. After weeks of planning the perfectly timed Chanukah cooking demo and tasting, we needed to postpone it due to unforeseeable circumstances. I love to share my experiences at compelling culinary events, so you might guess that I had a cool post sketched out. I was just waiting to perk it up with action shots of charming Alessandra barely breaking a sweat while she fried up 50 fritters, tempting close-ups of perfectly crisped, celebratory Italian treats, along with captivating descriptions of the Holy Pumpkin Fritters on the menu. If the irristable aromas of traditional potato latkes (pancakes) or sufganiyot (doughnuts) reduces your will power to nil, you’ll love these novel and unfamiliar fritters from my blogging buddy, Alessandra Rovati. These are not your Bubbie’s latkes. These puffed pastries are mildly sweet and fruity, with fresh steamed pumpkin, orange zest, cinnamon and raisins. They are airy and addictively delicious with unexpected texture from the pine nuts and candied lemon bits (optional) nestled into the tender, warm center. 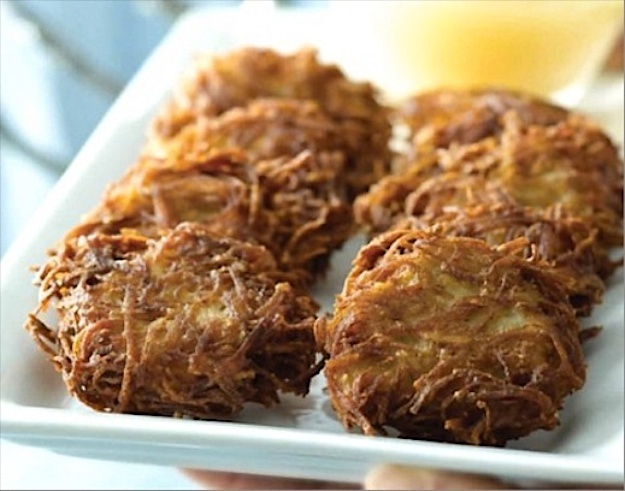 Try these for a novel twist on a fried classic at your Chanukah celebration. I can smell their warm, spicy scent and tantalizing savory undertones even before I heat the oil to the correct temperature!! Alessandra Rovati blogs at Dinner in Venice, where she shares the rich and ancient culinary history of the Italian Jewish communities. Her articles and recipes have been published in several magazines, websites and newspapers including the NY TIMES, The Huffington Post, and the Jewish Daily Forward. And if you are hankering for more traditional potato latkes or a vegetable variation on the latke theme, check out Levana Kirshenbaum’s latke post. She’ll tell you everything you need to know in“Fear of Frying”. Happy Chanukah (no matter how you spell it)! 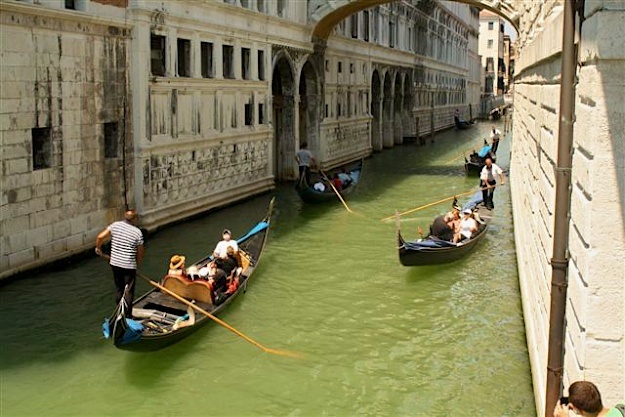 Thank you to Paula Koffsky for her photo of Venice. Plump the raisins in a cup of warm water. Chop the candied etrog or lime or lemon. Place the diced squash in a large platter and cover almost completely, leaving a small opening for the steam to come out, and microwave on high for 10 minutes or until very tender. Drain and dry the raisins, and add them to the mix. In a frying pan, heat the olive oil to frying temperature (you can test it by dropping a small piece of bread in the oil: if bubbles form around the bread, the temperature is right). Fry in small batches until golden all over, turning to cook evenly. Remove with a slotted spoon and transfer onto a platter lined with several layers of paper towels. Yes, will need to make these pumpkin fritters! Never used fresh pumpkin in my life…that will be a first! these look insane!! just printed the recipe and i am planning out the rest of the menu….but honestly what else do you need!!!! thanks liz for another fabulous post. wish i could have been there for this!! These sound great !! Any idea if these can be made and reheated? Or are the really only good right from the frying pan? Recipe looks delicious. Thanks Liz! You’re pictures and recipes always send me straight to the kitchen.. Looks amazing! I am so glad, Robin. I think this is a great alternative to traditional latkes,not that I don’t love those also! Enjoy! You’ll be ok re-heating these but I always prefer them straight out of the sizzling oil. Happy Chanukah! Carrie, You are in luck! We needed to reschedule our demo and tasting with Alessandra, so watch for the new date. Glad you are inspired. Hag Sameah! My husband made the Holy Pumpkin Fritters with butternut squash for last night’s Shabbat dinner. Fantastic! Thanks for sharing the recipe. So glad the recipe appealed to you! Happy Chanukah!